At the time it was radical and Reader's Digest ran a cover story calling it the 'Diet That's Killing our Kids' while the American Medical Association said it could lead to death. Which is pretty much true about any diet, the question is more about when than whether. Nowadays eating wholegrains, organic seasonal and local food, avoiding sugar and hydrogenated fat and artificial additives doesn't seem so weird but at the time it was revolutionary. So revolutionary that the FBI closed down the macrobiotic bookshop in NY and burned its books because they suggested that healthy diet could prevent cancer. So, in 1967, my brother and I started Seed Restaurant, the legendary hip -and hippie - macrobiotic watering hole of the late 60s, where brown rice and organic vegetables formed the backbone of the menu. We figured if the AMA and the FBI didn’t like it then it had to make sense. 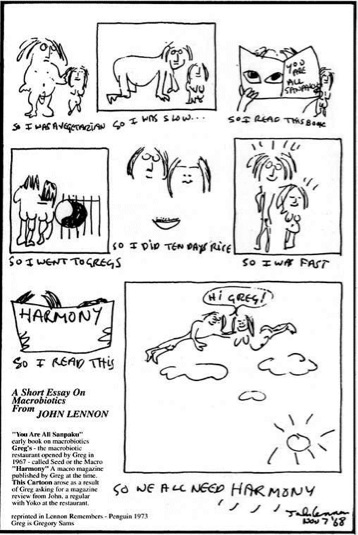 John Lennon gave my brother Gregory a little cartoon in appreciation of our food and of Harmony, the magazine Gregory published. I wrote a guide to macrobiotics called, imaginatively, About Macrobiotics, which was translated into 6 languages and sold nearly half a million copies. When I wrote About Macrobiotics I just tried to simplify the complexities of Yin and Yang that made some earlier books on macrobiotics daunting and even impenetrable. It was well received for that reason. 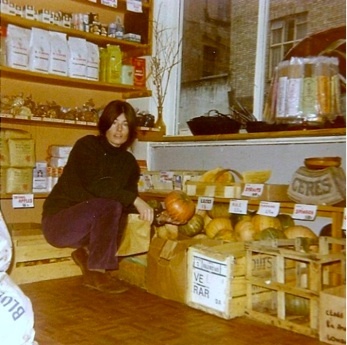 We soon had Ceres - Britain's first natural foods store - on the Portobello Road. Then other budding retailers came to us for supplies, forming the customer base for Harmony Foods, which evolved into Whole Earth Foods. Our business thrived on innovation. We were the first with organic brown rice and were known as The Brown Rice Barons because if you bought brown rice in the 70s it came from us. We bought and milled or flaked all of the organic grains grown in this country and usually exhausted available stocks before the new crop came in. In our retail and wholesale business we only sold food, only wholefood, no sugar and not even honey and no vitamins or supplements. We were macrobiotic then and I continue to follow the diet, not religiously but almost passively. In other words I eat whatever I feel like, but mostly I feel like eating wholegrains and vegetables. Occasionally I take zinc or Vitamin C when I feel a cold coming on, but otherwise don’t take supplements. 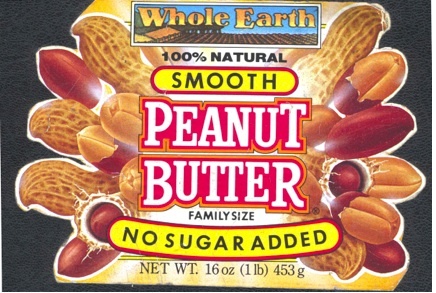 Eventually we pandered to market demand, with a successful brand of peanut butter that rose to take the number 2 position after Sun Pat in the UK market. I created the first range of fruit juice sweetened jams, using apple juice instead of sugar as a sweetener. We had created a market for sugar avoidance - and apple juice - if only for semantic reasons, satisfied it. In my quest for organic peanuts for our peanut butter I came across a group of farmers in West Africa who also grew organic cacao and from that encounter Green & Black’s, the first ever organic chocolate, was born. Needless to say, my kids, who had been brought up in a committed macrobiotic household, were somewhat dismayed to see their Dad going into the sugar business, but I consoled myself with the fact that 70% chocolate had a glycaemic index of only 22, less than half the GI of brown rice, and carried on developing the brand. So what are the key aspects of macrobiotics? You should eat wholegrains and vegetables as the basis of your diet. You should avoid preservatives and other chemical food additives. There are good nutritional reasons for all of the above, seasonal food is fresher, organic food doesn’t contain pesticide residues, wholegrains have more B vitamins than refined cereals and preservatives can give you cancer. But is there more to all of this? A nutritional therapist might feel that there is insufficient emphasis on maintaining a high intake of necessary nutrients and it’s true that in the early days a lot of macrobiotic followers looked rather wan and pasty-faced. They blamed it on expelling toxins but it was more like nutritional deficiency. Was it the fault of macrobiotics or was this part of a transition to better health? One of the key facets of macrobiotics is that you don’t get sick. Prevention is everything and cures are fairly perfunctory. One of the key facets of organic farming is that your plants and animals never get sick. Prevention is everything and cures are fairly perfunctory. In fact if you cure a problem with chemicals or drugs on an organic farm, whether with plants or livestock, you lose your organic status. The Soil Association regularly has a debate about its name. Should we change it to The Organic Society or something similar? We always decide to keep our rather unappealing name because we firmly believe that ‘The answer lies in the soil.” But we never ask the question: The answer to what? So how can the soil contain such a revelation? A gramme of healthy soil contains over 10,000 different species of microbial life, you could say that it is a microbiotic jungle. Except that it is remarkably ordered, with bacteria, viruses, algae and protozoa living in a web of complex fungal growth. Worms play an important role as well. We are always impressed at how well organised and efficient bees and ants are. But bees only have three variants – the queen, the worker and the drone. Ants are similar. Yet the most efficiently organised system we know comprises 1o thousand life forms, all working in close tandem. They communicate with enzymes, chemicals and odors and probably electric charges. Research into this is in its infancy. At the heart of the system is the fungal mycelial network that feeds the other life forms, regulates their growth and variety. In plant growth the most important are the mycorrhizal fungi, which are, to organic farmers the foundation of soil health and fertility. These organisms predate plants by 100s of millions of years. If your parents predate you then you consider yourself their offspring. We trace our ancestry back to early primates, respecting and recognising their importance in creating what we are today, a recognition confirmed by genetics and DNA research. We respect and honour our ancestors, but soil is seen as something dirty and underfoot, barely worth of recognition. Are we missing the point of our existence? Long ago, when the atmosphere contained a lot of carbon dioxide, life forms were anaerobic, they didn’t use oxygen in their life cycle. When the earliest microorganisms dwelt on this planet one group, the cyanobacteria developed the ability to convert carbon dioxide from the atmosphere, using sunlight, thereby opening up a new food source, thin air. Once this ability emerged, it was harnessed by the existing network. The cyanobacterial ability to make carbohydrates out of carbon dioxide was captured and enclosed in cells called chloroplasts and we had the first green plants. Plants are the means whereby a very well organised team of soil microorganisms can extract food from the air. The mycelial network brings together the rest of the life in soil to support this food gathering mechanism and to extract its main benefit to them, which is sugar. These fungal webs can have eight miles of thin mycelium in a single cubic inch, stretching over miles underground, communicating with each other. When you look at a tree or a blade of grass or a fern, you are looking at the food gathering and early stage digestion mechanism of a very clever bunch of invisible organisms. The plant works hard up there, busily converting carbon dioxide and sunlight and water into carbohydrates that it then feeds to its underground masters. It even knows who’s boss. It will only feed those mycorryzzal fungi that have the correct identity papers. They are good servants and only take orders from their master. When this happens the fungal lord inserts a tentacle or hypha into a subcutaneous layer of the plant root so that it can drink its sugar solution direct from the source. It needs to keep the plant going so it gathers phosphorus, nitrates and other minerals to ensure that the plant thrives and competes successfully with other plants. The mycorrhizal fungus lives for about 32 days, then as it decomposes it provides food for a network of other soil organisms that support it and that benefit from its demise. It generates a carbon-rich substance called glomalin, both proteins and carbohydrates, that is sticky and helps bind soil together in aggregates that give the soil structure and keep other soil carbon from escaping. As the world’s atmosphere became filled with the excreta of these plants the level of oxygen increased. It was now possible for new complex teams of soil biota to organise themselves to move about and capture plants. Animal life was discovered. In effect they invented airplanes and cars to increase their range and were able to capture from above the food of their underground brethren. With flying creatures and worms and eventually mammals, one thing was shared by all: a set of controlling microorganisms that guided every stage of the animal’s development, ensuring that it could gather food and reproduce. These mobile plants used smell and vision to identify likely food sources and arms, legs, mandibles, and claws to gather it up. There are 200-600 million nerve cells in the gut - more than in spinal cord, what does this tell us about the importance of the gut to intelligence and consciousness? It appears to be linked to information storage, decision-making and joy and sadness. The question is, who’s holding the reins? Is the control originating in the gut and determining our conscious decisions or do we make conscious decisions in our brains and then, for some reason, pass this information to the gut? A nerve is a 2 way street. No other part of the so called peripheral nervous system acts autonomously and locally. The Enteric Nervous System is called our ‘second brain.’ I submit that it could well be the Primary brain. After all, why does our gut need to tell our brain that it is regulating intestinal contractions, the release of digestive fluids and all the other activity in the gut? Our gut talks to itself and only bothers to communicate with our brain when it considers a message from the eyes, nose or palate about what food is out there. All the gut needs to tell our cerebral consciousness is if it feels pain, hunger or satiety. You don’t need half a billion nerve cells to do that. There are 500 to 1000 bacterial species alone in the gut with 2 to 4 million genes, if you look at them as one microbiome they contain 100 times more genes than the human genome and represent 10 times the total number of human body cells. They are overwhelmingly anaerobic, in other words they evolved in the absence of oxygen and like to keep it that way. The gut biota make a huge difference to the development of capillaries in the intestinal villi, promoting host nutrition. When they are absent a breach in the gut wall can be fatal, when they are abundant a breach in the gut wall is harmless and doesn’t trigger inflammation. So if soil biota and gut biota are related and our relationship to plants is derived from that ancient relationship what similarities are there between the way we produce our food, in soil and the way we prepare and digest our food, in our gut soil. Which the Chinese call ‘night soil. In the 1840s, when Baron Justus von Liebig discovered that nitrates and phosphates were essential soil nutrients it engendered a revolution in agriculture. No longer did farmers have to faff around with fallow periods, fertility building cycles or any of the traditional ways of extracting a crop from the earth. Instead they could add chemicals. What happened? First: The nitrates and phosphates short circuited the cycle whereby mycorrhizal fungi fed these minerals to plants in exchange for sugars. I have sinned against the Creator and, justly, I have been punished. I wanted to improve His work because, in my blindness, I believed that a link in the astonishing chain of laws that govern and constantly renew life on the surface of the Earth had been forgotten. It seemed to me that weak and insignificant man had to redress this oversight. But it was too late, human greed was in full spate and the farmer who didn’t use chemicals had trouble competing on price as part of his yields were sacrificed to keep the soil biota happy, reducing overall yields and income. Nobody got paid for maintaining topsoil depth and quality. Nearly one half of all the increase in carbon dioxide in today’s atmosphere since 1850 is the result of this folly. Global warming’s roots stretch back to his one big mistake that still haunts us. Liebig spent his later years on a project to recycle London’s sewage for agricultural use but lost the argument to the great Victorian sewer builder Joseph Bazalgette, who made sure all London’s waste was carried out to the Thames Estuary. If we are seeking parallels, what is the human equivalent of nitrates? Plants feed the soil biota with carbohydrates in the form of sugars in order to get minerals. Animals feed on plants in order to get carbohydrates. Around the same time that nitrates were introduced into agriculture, sugar became a major factor in our diet, with equally deleterious effects. Just as cheap nitrates killed off the web of soil life, so cheap sugar quickly pushed aside slower digestive and gut biota-based mechanisms to deliver glucose straight to the organism. Just like the poor old mycorrhizal fungi in the soil, the carbohydrate - producing digestive flora were outflanked and rendered redundant. Even more humiliating, the consumption of sugar led to rampant overgrowth of aggressive yeasts that caused all manner of upsets and the destruction of whole swathes of formerly stable gut biota. It also led to heart disease, diabetes, tooth decay, cancer and obesity. We don’t know what other quick fixes bypass the gut flora, but we should consider the impact on them when we consume vitamins or supplements that may displace some gut function and render it redundant, creating an ongoing dependency on supplementation. Bread suffered as well. Roller mills made white flour as cheap as wholemeal and white bread replaced wholegrain breads, with resulting diverticulosis and, thanks to industrial yeast, candida. Let’s compare 2 ways of making mankind’s principal food, wholemeal bread, the modern and the old fashioned . Old Fashioned – Judges Bakery process. Germinate wheat and liquidise. Add to organic wholemeal flour, add kelp powder, sesame seeds, hemp nuts and flax seeds. Make up a dough and let stand overnight in linen lined baskets for 18 hours. The enzymes from the germinated wheat snip the long chain proteins of gluten into shorter, less clingy and tastier proteins and make maltodextrins slowly available for fermentation. The bran softens throughout the process with phytic acid breakdown of up to 90%. Lactic acid bacteria increase magnesium and phosphorus solubitility. If you were a colony of gut flora, which bread would you prefer? What about worms? Not only are worms common flatmates with gut flora and soil flora, many species can live freely in soil and also survive quite happily in the digestive system. In the soil worms are the great grinders of all vegetable matter into fine particles. Charles Darwin wrote admiringly of their ability to pile up vast amounts of soil and raise its height. The soil doesn’t have teeth, but we do. Chewing your food 50 times does much of the work that worms do in the soil. This is recommended by all macrobiotic dietitians from Christophe Hufeland (Goethe’s doctor) through to George Ohsawa, creator of the Japanese version known as Zen Macrobiotics. So what if we just puree our food? Doesn’t that do the same thing? What about if you puree food and then spit in it and leave it for a while, won’t the salivary enzymes do the job for us? Research published in the Archives of Surgery showed that patients who had part of their colon removed passed gas and solids up to a day sooner if they chewed gum. The process of chewing stimulates nerves in the gut and hastens recovery. Now we have to ask what is stimulating those gut nerves, is it the chewing, or does chewing activate the gut flora, which then stimulate the gut nerves? When you chew the gut biota are getting a signal that food is on the way, so they become active in anticipation. This activity stimulates the nerves in the gut. In the gut worms are seen as parasites, but they fulfil similar functions in the case of roundworms, of helping with the digestion of food, particularly when it has been poorly chewed. They also provide exudates that prevent auto immune diseases such as rheumatoid arthritis and they are food for many fungi. In modern sterile soils worms are infrequent. I remember visiting Paul McCartney at his farm in Sussex, which is certified organic. He commented – ‘the Soil Association may say my land is organic but I don’t believe it really is until the soil is teeming with worms when the plough goes through.’ Could we consider the absence of worms as the pathology? When 80% of the world’s population are host to worms, can that be abnormal? What about Gooey stuff – mucus and humus. In the soil Glomalin is the product of the mycorrhizal fungi. It is sticky like glue and it binds together bits of sand and clay and organic matter into joined up granules called aggregates. These help to keep carbon in the soil instead of escaping into the atmosphere and they also help retain moisture. This creates ideal conditions for soil biota and a soil that is rich in glomalin has a high and stable population of bacteria, fungi and protozoan life. What is the digestive equivalent of gooey stuff? It’s the mucus membrane, but how do we support it? In macrobiotic medicine the cure for all tummy troubles is ume-kuzu. That’s a blend of kuzu arrowroot and pickled underripe plums that are rich in sodium sorbate, a natural yeast inhibitor. The yeasts get controlled and the kuzu provides a rich sticky matrix in which gut biota can flourish and rebuild their populations. Other sources of mucilaginous material are traditional remedies such as comfrey and aloe vera, both of which contain allantoin, which encourages cell proliferation. Chicken soup is a natural gel that also helps in this way. If our gut biota came from the soil itself, then is soil good for you? There are lots of examples of what is known as geophagia and not all of them relate to desperate hunger or psychological disturbance. When we don’t have food, we can still feed our gut flora and they can still feed us. We don’t just eat clay to fill our bellies, it may not have nutritive value by analysis, but if it provides a medium where gut biota can proliferate. We can then get nutrition from them. Pearl Buck’s novel The Good Earth describes how Chinese peasants would eat what they called ‘Goddess of Mercy earth’ named after Kwan Yin, the goddess of Mercy of Taoist tradition. In Taoism Yin is the earth and Yang is the sky. In Haiti mud cakes are a traditional food, particularly sought after by pregnant women, a compound of clay, fat, salt and pepper. Pliny recommended red clay as a remedy for mouth ulcers. In the Levant it was called Terra Sigillata and used to help childbirth and alleviate menstrual problems. In France they call it argillophagy and a popular hangover cure is to take argile verte, or green clay, in a creamy solution on the morning after. A three week course begins with a twice daily glass of white clay and then a transition to green clay mixed with liquorice powder, with separate doses of charcoal. And what about charcoal? I must confess a commercial interest here as the founder of Carbon Gold, an enterprise that seeks to restore the soil’s carbon content by the expedient of turning biomass into charcoal and ploughing it in. Charcoal encourages high populations of soil biota which are extremely stable, very water retentive and antagonistic to pathogenic fungi and bacteria, helping to prevent soil-borne plant diseases. Charcoal stays in the soil for hundreds of years so it effectively is the only way to remove carbon dioxide from the atmosphere and keep it out. It also reduces the acidity in soil that causes methane, turning this toxic greenhouse gas into the 60 times less toxic carbon dioxide. Charcoal biscuits and charcoal tablets are a common treatment for wind and other digestive upsets. They adsorb gases like methane and create a healthy environment for the gut biota to thrive, providing niches and structure in which a shattered gut population can rebuild itself. Just as it suffocates toxic bacteria in the soil, in the gut it cracks down on aerobic bacteria such as salmonella and shigella. Charcoal in soil encourages microbiological density, reduced activity but higher population. Let’s compare organic farming’s fallow periods with our own dietary resting times. One of my least popular sayings is: “Breakfast is the most important meal of the day - to skip.” I always try to skip breakfast and also to fast at least one day a month. Why? If your digestive transit time is somewhere between 12 and 18 hours then skipping breakfast means that for a few hours each day your gut is empty. This allows the gut flora to rebalance their population. Every time you excrete, one third of the weight of the faecal matter is gut flora who get flushed away, the remainder need time to recover from the loss of their gutmates. There are of course, also other factors – the blood glucose and the liver’s stored glycogen are used up by the time you wake up in the morning and so the body has to turn to its fat reserves for carbohydrates. It’s like the Atkins Diet, but without all the meat and fat. But it’s a good idea to let the gut flora have a rest in between bouts of food digestion. Organic and traditional farmers have fallow periods, the farming equivalent of fasting, where nothing is added to the soil, it is just left alone. The soil flora need a period when nothing is happening so that they can sort themselves out, deal with imbalances, before the next crop is planted. Fallow is not just about rebuilding fertility, it’s about recreating a healthy balance of food gathering biota. Eating food is like ploughing manure into a field. There is nutrient being introduced but there is also disturbance as a new set of nutrients is introduced, along with the oxidising effect of air on stored carbon, along with the disruption of the mycelial networks. I’ve just been in Belize. The farmers there don’t even plough the soil. The grow on quite steep hillsides with no erosion problems. Every year they let an area of ground become overgrown, sometimes for several years, then they cut the resulting vegetation and let it rot or, in some cases burn it off. They plant their corn direct into the ground, where the crop takes off, surrounded by beans and squash as ground cover, so that other plants are crowded out. The soil has no fertilisers, not even compost or manure, added to it and it generates healthy crops of corn with plants 12 feet high. The farmers abhor the idea of tearing up the soil and have resolutely avoided offers of rotovators and other mechanical ploughing aids. We can’t go back to that level of respect for the soil in today’s crowded world, but it is worth noting that in the long term agriculture has to address its problems of unsustainability and treat the soil as a living organism, not as a hydroponic system with dirt added. I was there in Belize because they supply cacao to Green & Black’s. They provide us with fully fermented cacao beans in which all the simple cyanins have been oxidised and have lost their astringent taste. The reason our chocolate tastes so good is because the farmers are so good at fermenting the beans. Every few months Mars publish more research saying that chocolate is good for the heart and have even launched a chocolate range in the US called Cocoa Via based on research that shows that anthyocyanins from unfermented cacao lowers blood pressure. So I took at look at the research to see why they’d launch a chocolate with a mildly unpleasant taste as a nutraceutical. What I came across was the European Polybind Project. They were looking at polyphenolic substances and trying to assess how they could help prevent cancer. They studied onions, apples, broccoli and chocolate. What did they find? Chocolate contains procyanidins and other simple phenolic compounds. When it is fermented these become oxidised polymers and lose their astringent taste. They also don’t have a noticeable effect on blood pressure, unlike unfermented chocolate where the phenols trigger a measurable pressure drop soon after ingestion. Hence Mars’ excitement about using unfermented chocolate in their products. But the Polybind Project found something else: the complex phenolic compounds stayed in the gut wall. When the host was stressed the gut flora would snip them up with enzymes and pass them into the host in the exact amount needed to modify blood pressure. Instead of outwitting and bypassing the gut flora, it makes more sense to work with them. The same arguments apply to inulin-rich foods such as chicory and Jerusalem artichokes. A ‘gut feeling’ is more than a feeling, it’s knowledge, indeed wisdom. The gut flora control intelligence. They can memorise and learn and encode much faster than multicelled organisms such as us. They don’t forget as their memories go straight to their DNA, which is constantly in flux. By maintaining a healthy balance and large population of gut flora the nutritional therapist also offers psychotherapy in a genuine way - this may be described as a ‘placebo effect’ by some, particularly doctors whose summation of nutrition is ‘eat your greens.’ By eating organic food we are mirroring the natural process by which healthy food is grown and we are avoiding the chemical residues that are just as toxic to the health of our gut biota as they are to the health of soil biota. To me the importance of nutrition has been a guiding light. I have not had to see a doctor since 1965. Nutritional therapy is ultimately about treating the originators of plant and animal life on this planet with the respect they deserve. More than that, with the respect they demand. They can get quite angry if they are ignored, as sufferers from IBS and colitis, to name a few examples, can attest. To go even further, if the gut biota are really the All-Knowing, All-Seeing masters of our universe, our original and true Creator, with a capital C, then the nutritional therapists are the high priests of human society and are our true link with the infinite and unknowable!